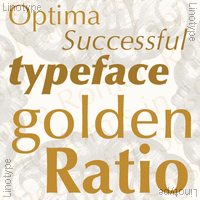 The font Optima was originally conceived as a competition for Ludwig & Mayer’s Colonia. Designer Hermann Zapf was guided at Stempel by Walter Cunz for the creation of these amazingly elegant and highly legible sans serifs of 20th century. The vigilant licensing policies of Linotype inspired a huge number of unauthorized copies.